Get ready! Because you’re about to be hit by a blizzard , no it’s not winter anymore, I mean, explosion of recipes, all of which are vegan, super vibrant, fresh, and absolutely delicious! For those of you who are staying in touch via instagram (it’s on the right-hand-side, just click and follow to stay up-to-plate with everything I’m whipping up), you’ve probably been wondering why I haven’t put up the recipes to those pictures and I apologize!! Sorry, I truly am because sometimes I click on something that looks totally yum hoping to find its recipe but then it just turns out to be foodporn, and that makes me really disappointed. I get that. 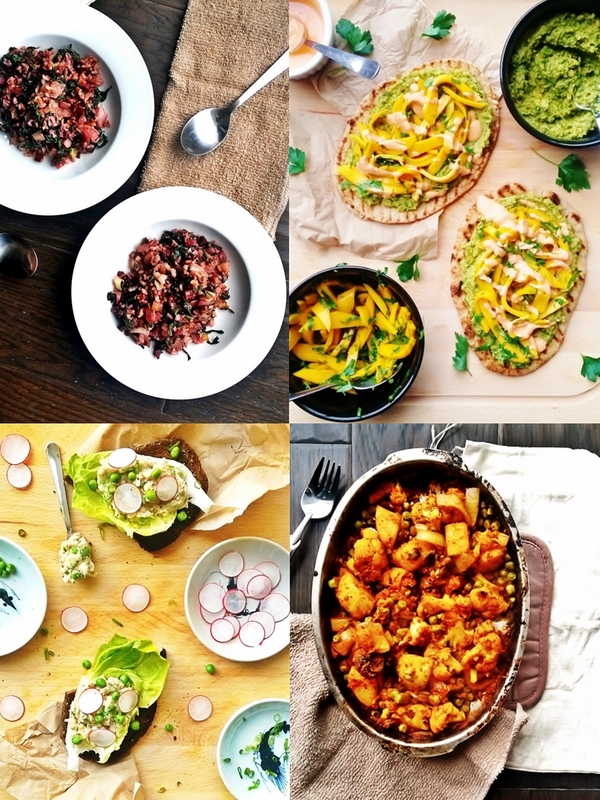 So here’s a treat: a collage of recipes to kickstart spring! Here I wanted to feature some of those under-acknowledged ingredients such as beet greens, parsley stems, green peas, and grainy mustard. Beet greens and parsley stems tend to just get trimmed off and thrown into the garbage which I find to be such a waste. Beet greens are actually loaded with all the great nutrients its roots has, but with more fibre and less sugar while parsley stems have even more flavour than the leaves, not to mention the nice texture it gives to the green falafel mash (recipe below!). Green peas and grainy mustard, on the other hand are like ugly christmas sweaters – you have them lying around not because they’re a kitchen staple, but because there was this one day when some magazine or trend convinced you to buy a bag/jar of the stuff (like how your friends convinced you of the sweater at Value Village). Then ever since that day it’s just been a shameful lump stuck in your pantry or fridge door. It’s okay, it’s all good, literally. And I encourage you to really take this as a new starting point, see what poor miserable thing is your fridge or pantry that you’ve been wanting to get rid of, and cook dat thang! To make the rice with beet greens, heat the oil on medium in a skillet or wok. Add the onions and let it sweat until translucent and fragrant. Turn up the heat to high and add the chopped beet greens, continue stirring until tender, then add the rice and season well to taste. Stir until the liquid is fully absorbed and mixture is heated through. Serve immediately, with an earthy wild mushroom or nutty pureed squash soup. To make the coconut butter, put combine garlic and coconut oil in a small bowl and microwave for 30-45 seconds until fragrant. Brush the mixture onto one side of the naan and put that side down on a hot grill pan (it’s still pretty cold where I am, but if it’s summer wherever you are and you have the luxury of using a grill, by all means fire it up!). Lift up a corner to see if it’s nicely charred, once it is, brush the oil on the upper side and flip it over to get it grill-marked. Put all the ingredients in a food processor and pulse until a coarse puree forms. Transfer to a bowl and drizzle with some more EVOO and set aside. Stir together the mango and parsley in a bowl and set aside. 2 heaping tbsp good quality mayonnaise, feel free to use your favourite vegan mayo or cashew cream! In a small bowl stir together the mayo, sriracha, and lime juice, adding a bit more sriracha or lime juice to get a nice drizzling consistency. To assemble, spread the falafel mash onto the grilled naan, top with the mango slaw, and drizzle with the sriracha aioli. Serve immediately with a minty cooler : blend together frozen yellow watermelon cubes + fresh mint + lime + coconut water! Preheat the oven to 450 degrees F. Combine all ingredients besides the honey and place into two large baking trays. Bake for 1 hr, stirring every 10~15 minutes. Drizzle with honey and bake for another 10~15 minutes until vegetables are tender and caramelized. Serve with coconut steamed basmati rice or garlic coconut butter grilled naan (above). Combine all ingredients in a food processor and pulse until smooth, you might need to scrape down the sides of the bowl a couple of times. Set aside. Spread a bit of the bean puree onto the toasted bread, then put the lettuce on (that way the lettuce will actually stay on the tartine). Fill the lettuce with more of the puree and garnish with the peas, scallions, and radish rounds. Happy spring cleaning your body, mind, and pantry!